Did you know more than 80 percent of the 1.6 million tons of construction and demolition waste generated in Minnesota goes to landfill every year? Minnesota always has a high level of construction activity. Even though this is a sign of prosperity, the waste generated is a problem. Hence, opting for construction and demolition junk removal in MN is important. Construction, renovation, and demolition of buildings or structures generate construction or demolition waste. Materials such as concrete, bricks, wood and lumber, roofing, drywall, and landscape come under this category. Dealing with the construction or demolition waste is one of the challenging tasks for most contractors. With the rise in disposal costs and diminishing landfill space is a pressing concern for those who are looking to clean up and dispose of construction waste. So, one should opt for reuse and recycling of waste materials to contribute positively to the environment. 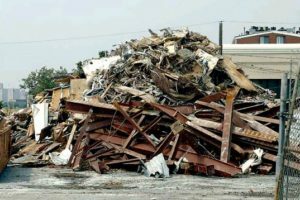 Before creating a management plan for construction waste, one must know what’s in their construction and demolition waste. Inert Construction Waste: Also known as public fill, these types of wastes mainly include materials such as construction debris, rubble, earth, bitumen, and concrete used for land formation. Non-inert Construction Waste: Non-inert construction waste make 20% of the total waste and include bamboo, timber, vegetation, packaging waste and other organic materials. These materials can be recycled or disposed of in landfills. Construction and demolition waste can be divided into a number of categories as follow. Construction and demolition materials such as concrete, porcelain, rigid plastics, tile, limber, metals, masonry, plastic, rock, carpet, insulation, and more can be recycled. Some of the wastes generated from the construction site are hazardous and can be harmful to human or environment in one way or the other. Here is a list of recyclable hazardous construction waste materials. Maximize recycling and reusing materials to reduce construction waste generation. Minimize sending mixed construction waste to landfills. Don’t dispose mixed construction waste in a single place. Design better and construct wisely to reduce construction waste. Recycling and reusing construction or demolition waste makes a real difference as it eliminates the need for landfills of 4, 300 acres at a depth of 50 feet from dumping waste. Visit www.junkhappens.com for professional junk removal in Minneapolis MN.